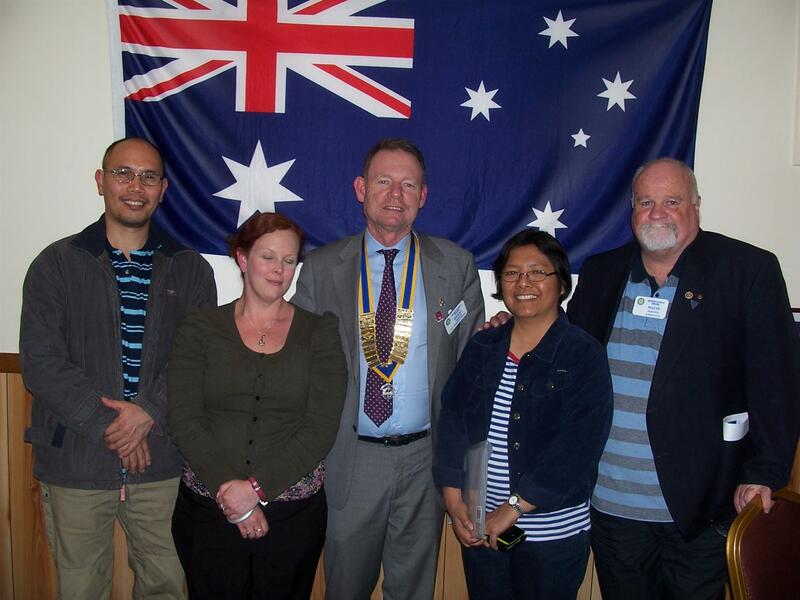 Pictures Above: Guest Speakers, President Micael Ambrose & Meeting Chairmen Wayne Robinson. President Miceal opened the meeting and welcomed visitors. Christmas dinner will be held at Wild Dog Winery and all are welcome – young and old, family members etc. Bill Burrows made it to Vietnam. Paul thanked members who volunteered their help. Merv Deppeler and David Proposch are co-ordinators. Vans can be parked either at Merv’s or David’s place. New Year’s Eve there will be a function to attend, fireworks etc and New Year’s Day would be on the Silt Jetty. All welcome! Kevin made up for his absence by fining just about everyone. Arrival tax – Don Kelly, Bill Petschack, Ian Haughton, and himself. Colin Gardner added that Don Kelly entertained the caravan travellers with his Burlesque show. Anne Hutchinson and Mimi Laurilla were welcomed by Chairman Wayne. Speakers Bank is an organisation for people with a disability to speak about their experience and to explain their disability. There are 35 guest speakers available to speak to groups. Annecto is an independent, not for profit association committed to increasing opportunities and choices for people with a disability. Anne is from Nar Nar Goon and her brain injury makes her reaction to stress very intense. In 2011 she began to be ill and was retrenched from her job. She had a stroke which changed her life dramatically. She found it very difficult to cope. Anne said the Guide Dog Program saved her as she suffered vision impairment. Anne is studying Advocacy through Yooralla and refuses to be a victim. Anne is now 33 and this was her first guest speaking event. It was a privilege to hear Anne speak about her life and the way she has overcome the difficulties she has faced.